Parts of 26 children’s bones were among the body parts exhumed from the Mannar mass grave upto February 6. Specialist judicial medical officer Dr. Saminda Rajapaksa said these were among parts of 297 human bodies exhumed so far from the mass grave.Dr. Rajapaksa said six sample body parts subjected to carbon testing were sent to the carbon dating investigation laboratories in Florida, USA on January 23.This report will be received in about a week. He said the Florida Laboratories had been requested to submit the carbon dating report in writing separately to him and the Mannar Magistrate’s Court. The samples of body parts sent for carbon dating abroad were obtained on the orders of the Mannar Magistrate in the presence of a team of specialist JMOs, senior professor of archaeology Raj Somadeva of the Kelaniya University, representatives of the Office for Missing Persons, the Government Analyst, representatives of the Mannar District missing person’s relatives organisation and a team of state counsel. The body parts were selected in a fully transparent manner before all concerned parties. Dr. Rajapaksa said investigations at the mass grave had been conducted for 139 days and body parts relating to 312 bodies had been identified. Investigations began in the relevant site after several body parts were found in a load of earth removed from the dismantled Mannar old Sathosa building deposited in Emil Nagar in Mannar on March 26. Excavations began at the spot on the orders of Mannar Magistrate A. G.Alexraja following a report about the spot submitted to court by the Mannar police. On the orders of the incumbent Mannar Magistrate T.Sarawanaraja, Prof. Raj Somadeva and specialist JMO Dr. Saminda Rajapaksa are conducting investigations at the site with the assistance of Mannar police, JMOs and officers of the Government Analyst’s Department. 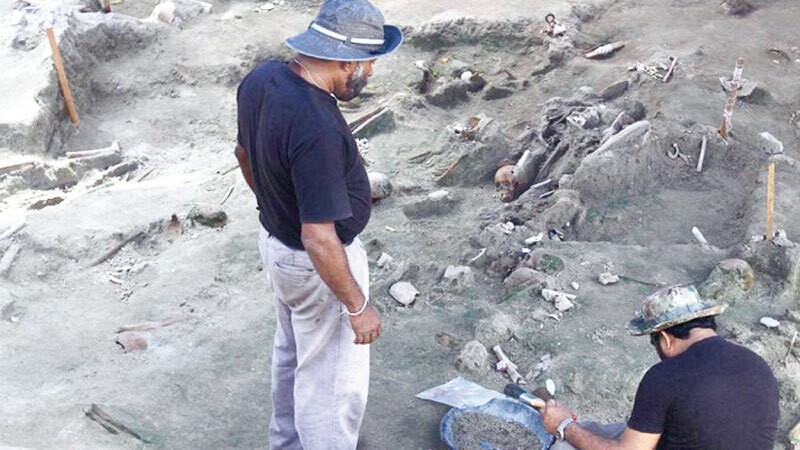 Prof. Somadeva said body parts found beneath the Mannar CWE building site had not been subjected to dating so far. During the investigation they found some body pars buried in a systematic (orderly) manner and some others buried in an unsystematic (in orderly) manner. Some body parts found were not in keeping with a traditional cemetery.